This week with my online grocery shop, I ordered a large box of Special K, mainly because it was on special offer. I'd order it every week as my kids love it, but it’s just so expensive these days (as are most branded cereals, sigh). 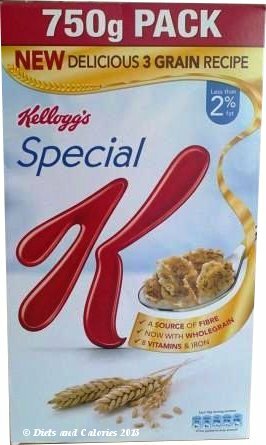 What I didn't realise was that Special K has had a makeover, or as Kellogg's say - it’s been improved. Now, instead of having rice and wheat as the main ingredients, Special K is made with three grains: Rice, Wholewheat and Barley. 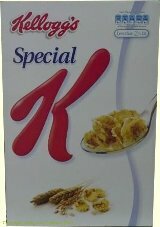 As a Special K fan myself, I was worried as to how this would affect the taste. It's already got a unique flavour that none of the copycats can recreate. I've tried buying cheaper own brand creations, but they don't compare well. So what has this new improved makeover done to the taste? Not so good, there is still a high level of sugar with 17g per 100g or 5g per bowl (just over one teaspoon). However, this is the same amount of sugar as the original Special K recipe. Pouring it out, it's instantly noticeable that the new version has a darker colour, no doubt due to the wholewheat. The outside of each flake seems to have a slightly sweet coating which I don't remember on the original flakes. Maybe it has something to do with the colour. And onto the taste test… yay, they taste just the same, maybe a little crunchier but still with the unique delicious rice flavour. Contains vitamins D, C, Thiamin (B1), Riboflavin (B2), Niacin, Vitamin B6, Folic Acid, Vitamin B12, and the mineral Iron. Nutrition information per 100g: 375 calories, 9g protein, 79g carbs, 17g sugars, 1.5g fat, 0.3g saturates, 4.5g fibre, 1.0g salt. New recipe includes rice (45%), wholewheat (32%), barley (8%). Nutrition information per 30g serving with 125ml semi skimmed milk: 172 calories, 7g protein,30g carbs, 11g sugars, 2.5g fat, 1.5g saturates, 1.5g fibre, 0.44g salt. Nutrition information per 30g serving without milk: 113 calories, 5g sugars, 0.5g fat, 0.1g saturates, 0.3g salt. Per 30g serving: 173 calories with 125ml semi skimmed milk. Nutrition information per 100g: 379 calories, 14g protein, 76g carbs, 17g sugars, 1.5g fat, 2.5g fibre, 0.5g saturates, 1.15g salt. For more Special K posts, see here. Well spotted and a good review. I like that they've increased the fibre content and slightly reduced the salt. What I do find odd is the reduction in protein. Definitely will be on the look out for these. Yes, the protein reduction is odd. Have to add more milk! Thanks for your comment. The new 3 grain Special K tastes like crap/cardboard. What is worse they have stopped the old one. This deserves to be professional suicide for ignoring what the custumer wants. I don't like the new recipe at all. It's 'claggy', tasteless and just plain horrible. I've bought Special K Red Berries for years, but not any more - there doesn't seem to be as much fruit in the boxes either. It seems like the new recipe Special K is either a love or hate affair for most people. It would be interesting to know how sales are faring!